With Kristaps Porzingis and Tim Hardaway Jr. continue to miss games, the Knicks are having a hard time in staying above .500. Last night, against the Pacers, they trailed by as many as 38 early in the third quarter before finally admitting the defeat, 97-115. 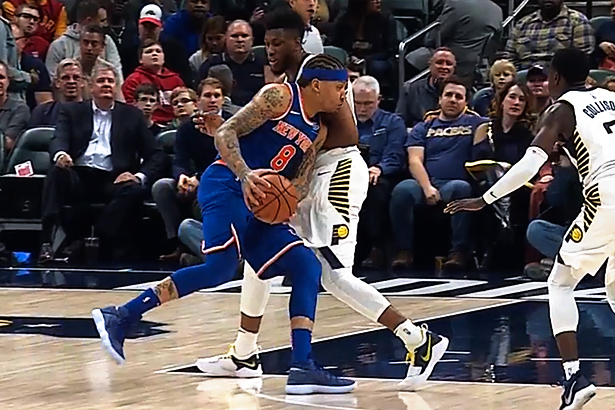 The Pacers had seven players that scored in double figures while the Knicks had only three, two of which came off the bench. Michael Beasley got to start again for KP and scored 13 points while shooting 60% from the field but also committed 5 turnovers. All the other starters finished with less then 10 points. The good news was that Willy Hernangomez received again important minutes (16) and finished with a team high 14 points while also grabbing 10 rebounds to be the only Knick in double double. However, most of the minutes were in the fourth quarter, when Jeff Hornacek had already given up on the game. Doug McDermott contributed with 12 buckets and Ron Baker & Damyean Dotson added 9 points each. With a horrible defense, the Knicks allowed the Pacers to shoot 53.5% from the field including over 40% from behind the arc. In fact, 33 of Indiana’s points came from long distance compared to New York’s 18. Thaddeus Young scored a game high 20 points, Bojan Bogdanovic followed with 19 and Victor Oladipo added 16. All of Pacers’ starters scored at least 10. The Knicks continue to struggle on the road and are now 1-7 when they don’t play at Madison Square Garden. They also dropped under .500 for the first time since they were 3-4.